When Slow Foods, the Cambridge Brewing Company (CBC) and Island Creek Oyster got together on March 3, 2010, 60 people had an evening they won't soon forget. 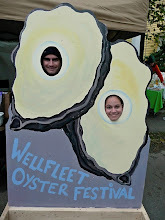 Overall the evening benefited the non profit, all volunteer run, Mass Oyster Project. Frequent readers of this blog are no strangers to MOP but for those visiting for the first time, MOP is doing great and important work placing water cleansing oysters in the river mouths and bays around Boston harbor to help clean the water. Learn more about MOP here. 4. having fun eating well. To become a member or to learn more about the national organization of Slow Foods, click here. So what made the night unforgettable? The food and beer pairing! The beer was plentiful and the food was top notch, local and fresh. MOP, you're doing great work and making it easy for people to support you at your events. I can't wait to see and taste what you have next for your supporters!